Yeah, I made that. What mystic sorcery did I employ, you may ask? What arcane formula and esoteric ingredients did I combine to create this beautiful, beautiful confection? Did I temper it, or boil it, or just forge it with lightning? Forget that. I made this in about 30 seconds. If your coconut oil has solidified, run the closed container under hot, hot water until enough is melted for your purposes. Measure ingredients into a small bowl and mix together. I like to use a small rubber spatula because it’s easier to extract every scrap from the bowl! 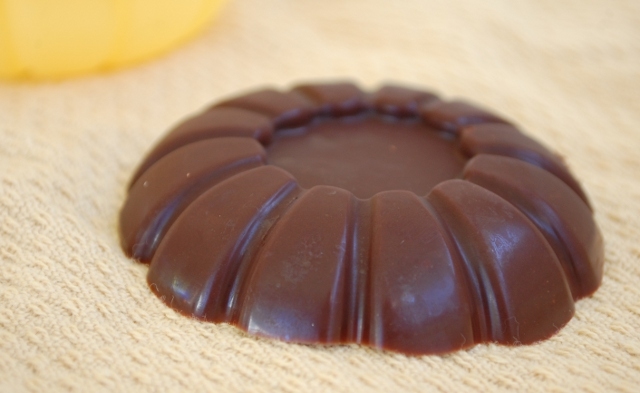 Transfer liquid chocolate to the mold of your choice and place in the freezer (if you want it ASAP) or the fridge (for people with patience) until solidified. This chocolate will definitely melt in your hand unless the weather is really cold (remember, coconut oil has a melting point of 75 degrees Fahrenheit) but it’s soooo smooth and delicious you won’t mind licking your fingers. See how smooth and perfect it is inside? (Um, except for the powdered sugar that I didn’t quite get mixed in, in my haste. Don’t hate!) I’m already plotting some sort of filling for this so I can make a tiny candy bar. 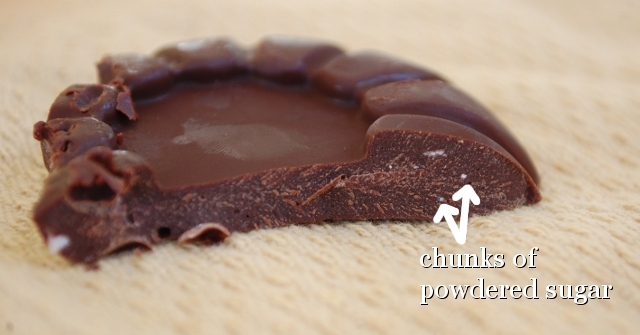 This recipe as written is 160 calories, but you can make it larger or smaller as you like, just keep equal proportions of sugar, cocoa, and oil. This entry was posted in Make it in Minutes, Recipes. What a wonderful blog! How do I subscribe? Delicious! This chocolate looks very mouth-watering. Thank you very much for sharing this recipe to everyone. What cocoa brand did you use for the ingredient? I would love to make this one day.